This blog post was written by Patrick McDonagh, FableVision Learning marketing intern. 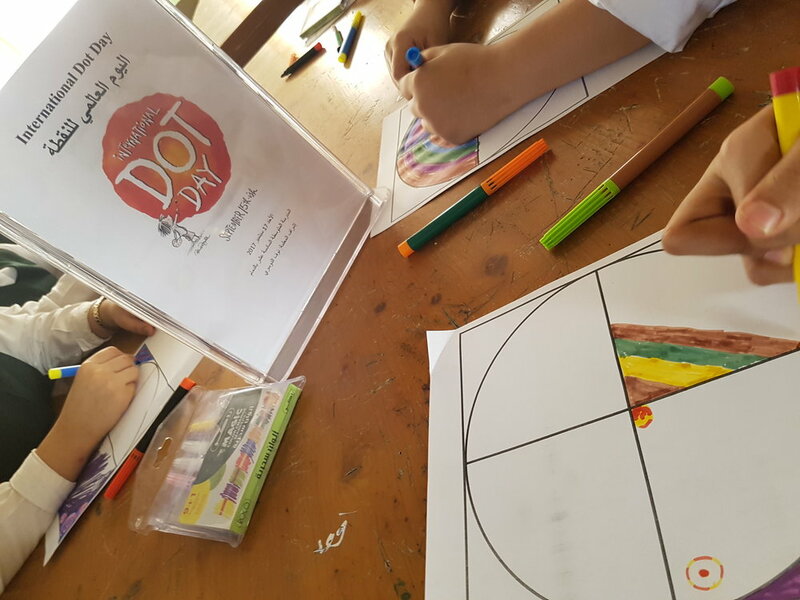 On Sept. 16, Nouf Arar Aldossary a 7th and 8th grade math teacher in Dammam, Saudi Arabia celebrated International Dot Day. For Nouf, it was a special celebration. The school joined over 10 million dot makers in 170 countries for International Dot Day, a truly global celebration of creativity and courage. To learn more about Dot Day, celebrated every Sept. 15-ish, click here. We were excited to connect the dots with Nouf to learn more about the school’s first Dot Day celebration. Read on! How did you bring the Dot Day experience to the classroom? I gave 7th graders worksheets with a circle divided to 4 sectors, and told them to make their mark - just begin with dot and see where will take you. For 8th graders, I gave them a large amount of colorful magnetic circles (400 pieces), and asked them to design a creative artwork on the whiteboard. Then, students asked me to continue to celebrate Dot Day on the next Sunday Sept. 24; to celebrate the national day of Saudi Arabia (it was on Friday 23 September 2017). They put a black magnetic circle on the whiteboard, then put the green magnetic circles surrounded by white circles, and put colorful magnetic circles around it. They mean that Mecca (black circle) is the heart of Saudi Arabia (white and green circles), and Saudi Arabia is the heart of the Arab and Islamic worlds (colorful circles), the investment powerhouse, and the hub connecting three continents, which align with 2030 vision. We spent another 3 hours to complete the creative art work. The students and I are so proud of our work! How did you use Dot Day themes in your mathematics teaching? They said that a dot is so important in mathematics because everything consists of a dot. A straight line can be drawn between any two dots ( Euclid's elements). Then I asked them: “what about life? is the dot an important symbol in our life?” they said that the dot refers to the beginning of everything, the beginning of success, the beginning of creativity, the beginning of our journey into life. Who or what inspires you to make your mark every day? Because a dot of blood saves a human, a dot of water quenches thirst, and a dot on the letter gives meaning to the word; so the dot deserves to be celebrated. It inspired me and inspired my students to make our mark in our community. In future, I will do another Dot Day with students in grade 1 and grade 3 in the new school to inspire me to a new happy life. How did you Make Your Mark on Dot Day? We love seeing all the Dot activity on social media! Continue to share your #DotDay celebration with by using the #DotDay and #MakeYourMark.